Gyros Breakfast Burritos, what a way to start the day! Spinach, beef, yogurt, feta cheese and cucumbers…this makes breakfast positively delicious. Make yogurt dressing by combining yogurt, cucumber, olive oil, mint, lemon juice and salt in a medium bowl. Set aside. In a large non-stick skillet, add beef and onion. Cook over medium heat until beef is browned. Stir in garlic, tomato paste, oregano, basil, salt, cinnamon, fennel seeds and cayenne pepper. Add spinach and raisins. Cook until heated throughout. In a medium bowl, stir eggs with a fork or whisk until well beaten. Pour eggs into beef mixture. Stir and cook until eggs are set about 10 minutes. 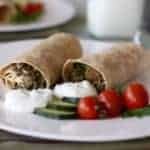 To make burritos, spoon filling onto tortilla, sprinkle feta cheese over filling then drizzle yogurt sauce over cheese. Fold tortilla around filling. Burritos may be frozen but omit the yogurt sauce. Wrap each burrito in plastic or foil and store in air tight container. Unwrap and reheat in microwave. One of the things I like best about this recipe is that I get bestovers. I freeze the leftover filling or filled burritos for later. NOTE: The yogurt sauce makes enough for four burritos.